Happy Friday fellas and ladies! Well with the little bit of news this week, that the Thunderbolts may receive their own show on Netflix, suddenly the Incredible Hulk #449 is a $50 book. What many people do not know, is that the book had a variant / reprint. It was produced by American Entertainment (yeah, remember them?). It was called Thunderbolts Prelude #1. Semi-good cover by Mark Bagley. This was released in May 1997, while the original was released January 1997, so I would consider this a reprint. 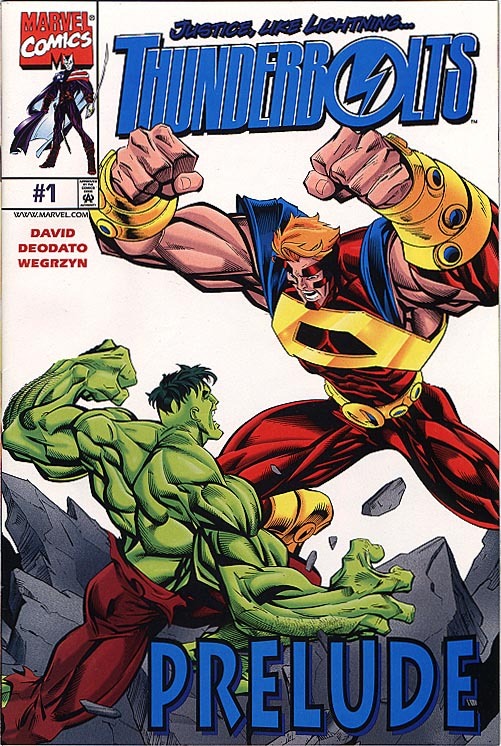 The Incredible Hulk 449 had a print run of approximately 85,000. I cannot find complete confirmation, but I do know a lot of AE books had a print of 5,000. So, I cannot say for sure that is the print run, but if so, this would be something like a 17:1 variant. Right now, they are somewhat hard to find, especially in the wild. The bay has some sold, and for sale around $10-$25. With a Bagley cover, and the resurgence of the Thunderbolts, this may be one to get a hold of now, and hold onto, especially if a show is in sight. Nice research. Thank you Jason. Would Thunderbolts # 0 be worth anything…? It came out around the same time as Hulk # 449. Correction – it debuted a year later. Good stuff Jason! Semi-good lol. Got a copy this week at a flea market for a buck.